You can return to our strawberries page or browse the pictures using the next and previous links. Thaey go so well together. Both the Fragarias that you sent to me are doing very well. Thank you...That's nice to hear, Toto...now you'll have to get a Heuchera lol - I think this might be 'Peche Flambe'. I have already ordered a Heuchera, I think it is called "Electra" it is one that I selected following you advice as to what to put with my Ophiopogon. Thanks, Flori...I don't know 'Electra' Toto - maybe Vicky will have one at Malvern! I have ordered mine from Fothergill's and they should be delivered in May. That's good - are they of a size to plant out, or will you have to grow them on for a while? Rosie Pinks just lovely , like the Fragaria not seen this one around before! Shall I root one for you, Pp? They send out 'runners' and I could do, if you like. I think that they should be ok to put out but to be on the safe side I will put one out and pot the other two. This photo is of species Fragaria 'Pink Panda'. 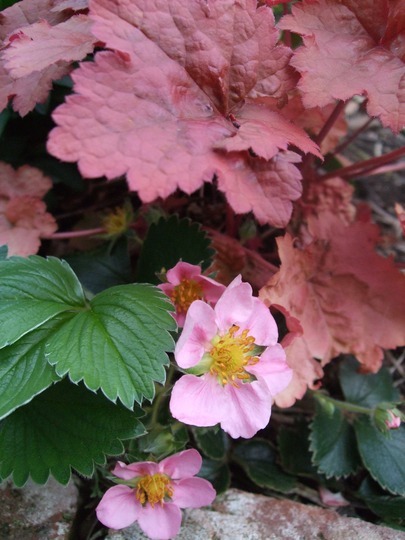 See who else has plants in genus Fragaria.